Get the most out of your grocery shopping with this innovative shopper’s guide and cookbook rolled into one. In Eat Good Food, former chef Sam Mogannam, owner of San Francisco’s popular Bi-Rite Market, guides you through the grocery store one department at a time, and explains how to identify incredible ingredients, decipher labels and terms, build a great pantry, and reconnect with the people and places that feed us. Eat Good Food gives you a new way to look at food, not only the ingredients you buy but also how to prepare them. 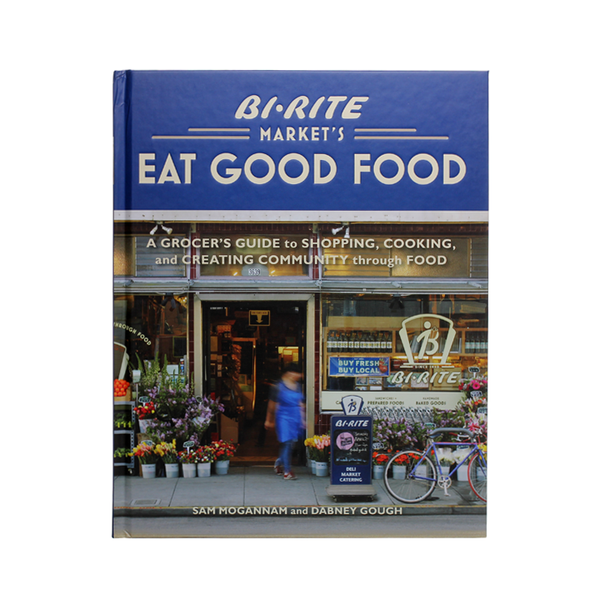 Featuring ninety recipes for the dishes that have made Bi-Rite Market’s in-house kitchen a destination for food lovers, combined with Sam’s favorite recipes, you’ll discover exactly how to get the best flavor from each ingredient. Dishes such as Summer Corn and Tomato Salad, Spicy String Beans with Sesame Seeds, Roasted Beet Salad with Pickled Onions and Feta, Ginger-Lemongrass Chicken Skewers with Spicy Peanut Dipping Sauce, Apricot-Ginger Scones, and Chocolate Pots de Crème will delight throughout the year. At fine book retailers everywhere.